I ain’t gotta say too much else about this, right? 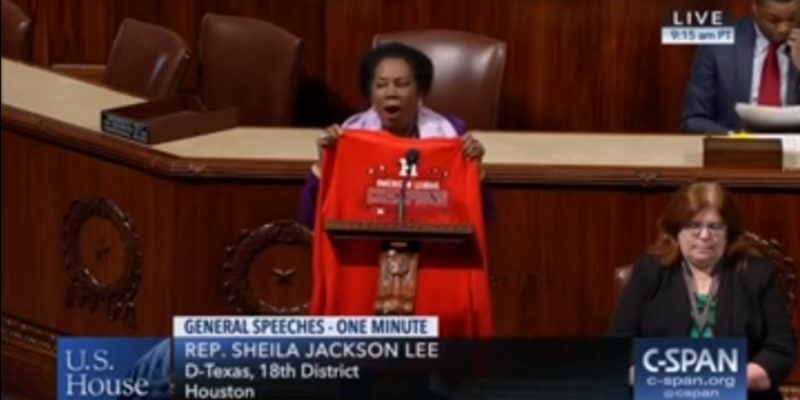 It’s Sheila Jackson Lee givin’ a speech on the floor of the House of Representin’, and she’s congratulatin’ the Astros on winnin’ the World Serious. That alone is comedy gold, right? She can’t pronounce Altuve, and she spends half the speech thankin’ the mayor for the Astros winnin’ when she’s not talkin’ about “the battlefield of baseball,” but what do you expect? It’s Sheila Jackson Lee, for cryin’ out loud. Gives me a good feelin’, almost like the good feelin’ enjoyed by the separate nations of North and South Vietnam who live side by side in harmony. Or when I think about our 400 year old US Constitution. Or when I consider that Wikileaks and Wikipedia are the same thing. Or when I consider that flag Neil Armstrong planted on Mars. But it doesn’t make me wanna go work for her. I hear you really don’t wanna go work for her. She’s about as nice as she is smart, they say, and they ain’t complimentin’.